We should join him in his fear. Not just Switzerland, but most of the world (the US included) will suffer if the current protectionist tendencies become worse. Only small, isolated countries like, say, Moldova would perhaps not feel the consequences too badly – but that’s because they are very poor to start with. Once you hit the ground, it’s quite hard to keep falling. US President Donald Trump is particularly fond of trade protectionism, probably because he believes the world’s biggest economy is self-sufficient enough not to suffer if the global economy goes into a spiral of trade restrictions. But he should look at a chart that Jordan presented alongside a recent speech on the dangers of protectionism. It shows the effects of the protectionist measures taken during the Great Depression of the 1930s, compared with the consequences of the 2007-2009 financial crisis on the global economy. Protectionism took a heavy toll on the world economy in the 1930s. The difference in outcomes is stark. 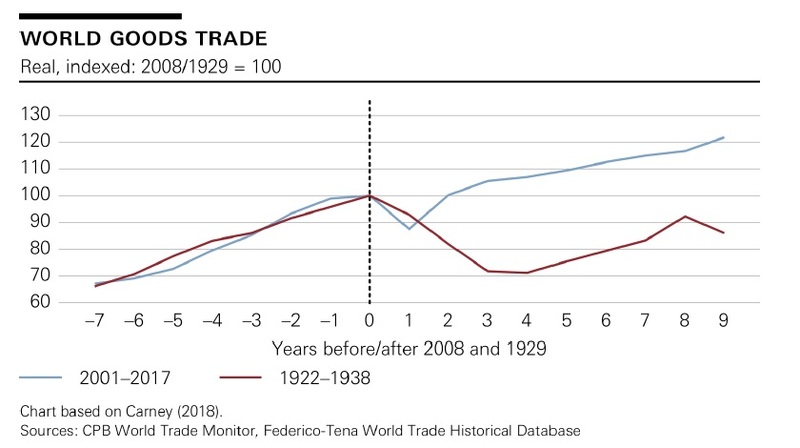 With policymakers determined not to repeat the mistakes of the 1930s, the global economy recovered relatively quickly after the financial crisis. However, a decade on, the danger of protectionism is resurfacing, largely due to Trump’s ambition to renegotiate the trade deals that the US is part of. If a full-fledged trade war erupts, central banks will be faced with some very difficult decisions, depending on which economic scenario they prefer: high inflation but a gentler economic downturn, versus relatively tame inflation with a deep economic contraction. History shows that usually, central banks have preferred the first option. High inflation is considered to be a tolerable sacrifice if it means employment is in reasonable shape. It is likely, therefore, that most central banks will choose to let inflation run high if protectionist measures intensify and a trade war, followed by a currency war, occurs. This in itself is dangerous. Protectionist measures will choke off supply, pushing prices even higher if it results in shortages of goods. On top of relaxed monetary policies trying to stimulate domestic economies, this could fuel a fire that central banks will find difficult to put out.